Saint Patrick's Sale 2015 - QuWave Law of Attraction Magnet QWM1 50% OFF Sale. This week is our annual Saint Patrick's Day Sale! To celebrate the "Luck of the Irish", we are offering a $149 50% discount on our popular "Law of Attraction Magnet". This product is so successful, that customers have been calling it the "Money Magnet". Now you can manifest all your dreams for half the price! It's easy to get your 50% $149 discount. Just order the QWM1 from here (Click). Then, at check-out, just enter this Discount Code into your Shopping Cart for instant savings. Personal "Law of Attraction Magnet QWM1"
2. 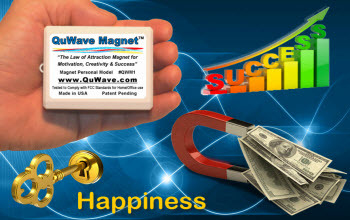 This promotion applies only to a purchase of the Personal QWM1 "Law of Attraction Magnet" .